Yesterday, the great American poet, Mary Oliver died, at age 83. Her poetry grew out of a love for nature, that served as a refuge during a turbulent childhood. In the woods and ponds around her rural Ohio home, she found beauty, healing and hope. Throughout her adult life she would find wisdom and renewal in the her daily walks along the beaches and forests of Provincetown, Cape Cod. Red Bird reminds us that beauty however fleeting, comes into even the darkest of times. 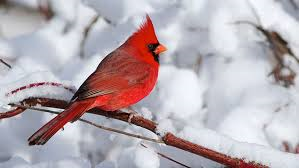 May Red Bird speak to you. Mary Oliver…sigh. She’s a treasure. So many great poems. Her compilation in Red Birth and Thirst have been such a gift to me. Wonderful Poem. I will remember her, and maybe look for some of her work. Thank you. We have a Cardinal couple that has lived in our yard for a couple of years, and I think maybe their children as well. We had three males and one female at our bird feeder a few days ago. The gift of color!